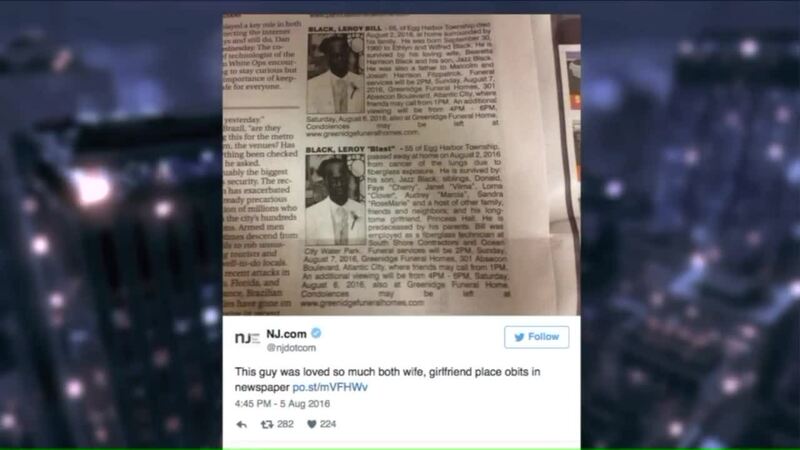 A New Jersey man who recently passed away was remembered by two separate obituaries in the same newspaper: one from his wife and one from his girlfriend. Leroy "Blast" Bill Black died Tuesday of lung cancer, and shortly thereafter, two different obituaries appeared in the same edition of the Press of Atlantic City. In one obituary, Black was described as being survived by his "loving wife Bearetta Harrison Black," while the other says he is remembered by his "longtime girlfriend Princess Hall". The paper ran both obituaries because "the wife wanted it one way and the girlfriend wanted it another way," according to the Philly Voice.